1. It may seem to the casual observer browsing the back-issues of Heli-Kit News that I have a rather low opinion of Italeri's efforts on the behalf of the Helicopter Modeller. It is certainly true that from time to time I have found cause to take exception to details such as rotors made to revolve in the wrong direction, grossly incorrect dimensions, and so on. It easy to criticise, but I would now like to take the opportunity to look at the other side of the coin. Without the contibution made by Italeri over the past decade, the inventory of helicopter kits would be very much poorer, particularly in 1:72 scale. Alone among the major kit makers, Italeri has consistently innovated, year on year, with new subjects and variations. A quick glance over my shoulder at my own modest inventory of unbuilt kits is enough to show that I have bought far more Italeri kits than those of any other manufacturer, and a glance over the other shoulder at my display cases shows how much I enjoy building them, whatever shortcomings they may have, and many of them have none worth mentioning. So if I should seem to complain overmuch about this or that detail of an Italeri kit, please remember that deep down I have great affection for them, much as one loves a recalcitrant or wayward son. Long may they continue. "Put out the word to friends, club members and helo addicts. The test shots for MRC's new 1/35 UH-60L arrived today. I counted over seven parts for the rotor/mast assy alone. The engine is detailed out. The kit includes two M60's and a full complement of troop seats with the web straps molded in. Seat braces are exceedingly fine. Surface detailing is outstanding. I haven't checked the basic fit of the parts yet. Look for the test shots at the IPMS/USA Nationals." 3. Lennart Lundh tells me that Schiffer has finally scheduled a September release for "US Army Aviation Color Schemes and Markings, 1942 to the Present". 4. 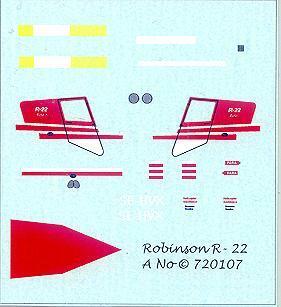 Ted Burnett of the Swedish Air Force SIG has sent me an interesting little sheet of decals for the Pavla Robinson R-22. The markings are for the Swedish civil registered R-22 Beta SE-HVX, which bears the text 'Helicopter Assistance, Bromma, Sweden'. This sheet #720107 has been produced by Anders Nowotny on an Alps printer. I am impressed by the detail and crispness of the printing, which is very fine indeed. #7205 - Mil Mi-8MT (Mi-17) Hip H Afganistan Gunship conversion, which includes the KP kit, decals, 61 resin parts and 34 etched parts. #7206 - Mil Mi-Hip H Czech SFOR conversion, includes KP kit, decals, 30 resin parts and 34 etched parts. Drawings from both these were included in HKN #89. 7. Twobobs Aviation Graphics are now listing the first in their new range of 1:48 helicopter decals, #48-005 Foreign User Colorful Cobras. I believe this will include markings for Cobras from Jordan, Bahrain, & Turkey. These should be available soon. 8. The second volume of Ralph Young's epic 'Army Aviation in Vietnam' is now available. This covers the period 1963-1966. In 8.5" x 11" format, it has 164 pages, 150 colour, and 270 monochrome photos; over 110 patches and insignia, 11 color profiles, more than 30 color scrap drawings of aircraft markings, uniform study etc. 45 units are covered in a similar format to Volume 1. There are some super camouflage schemes covered in this period, particularly on the UH-1B Huey, and a great scheme for the CH-37B Mojave, with those eyeballs. Too bad no readily available kit exists. The books will be carried by Midland Counties Publications within a few weeks, or contact the author. Thanks to Joe Hegedus, Ted Burnett, Lennart Lundh, Ralph Young, and especially to Grant N. Flanders.